Owl Labs, Inc. (“Owl Labs”, “We”, “Our”, “Us”) warrants to the original purchaser (“You”) that Meeting Owl (“the Product”) shall be free from defects in both materials and workmanship and shall materially conform to Our standard Product documentation (found at owllabs.com/support) during the Warranty Period. Should You notify Us during the Warranty Period (as defined below) that the Product does not conform to the foregoing warranty, We agree, at Our option, to repair or replace the Product free of charge. The Warranty Period is one (1) year from the date of purchase. We will ask You to please provide proof of purchase with any warranty claim. If no proof of purchase is available, the Warranty Period will be one (1) year and three (3) months from the manufacture date of the Product. If We determine in Our sole discretion that Your warranty claim is valid and we issue a Return Merchandise Authorization (“RMA”) to You, the Product should be returned to Us within fifteen (15) days of Your receipt of the RMA to the location specified by Owl Labs. If Owl Labs customer support determines that You have a valid warranty claim, Owl Labs will pay for shipping and handling of the returned Product. Please package your Product carefully as the Product will be returned to You in the same cosmetic condition it was received by Us. Owl Labs will exercise commercially reasonable efforts to have Your replaced or repaired Product returned to You within four (4) weeks after Our receipt of the returned Product. 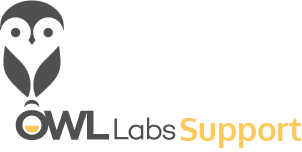 Prior to contacting Owl Labs customer support, please visit owllabs.com/support to review Our troubleshooting FAQs, which can provide valuable technical assistance. If You need additional help, you can find our support contact information at owllabs.com/support. When You contact support, You may be asked to perform a built-in system test to help diagnose and confirm the issue. Please have your serial number located on the bottom of the unit available. If We determine that the Product needs to be returned, an RMA will be issued. Return the Product to the location specified by Owl Labs customer support, and display the RMA number on the outside of the shipping package. Ship the Product without any accessories unless instructed otherwise. Package and ship the product as directed by Owl Labs customer support. Once We receive the Product, Owl Labs will, at its sole option, either exchange the Product with a Product that is new, or has been remanufactured and is at least functionally equivalent to the original Product, repair the Product, or exchange the Product with a product that is a new and upgraded model which has at least the equivalent or upgraded function to the original Product. Owl Labs warrants any replaced, repaired or remanufactured Product or part for ninety (90) days from the date of shipment of the Product to You, or the remainder of the initial warranty period, whichever is longer. The Product has been damaged by negligence, accident, act of God, or mishandling, or has not been operated in accordance with the procedures described on owllabs.com/support, or; the Product has been altered or repaired by someone other than Owl Labs or an authorized service partner, or; adaptations or accessories other than those manufactured, recommended or provided by Owl Labs have been made or used with the Product, or; failure to adequately package the Product for transportation, or; the software on the Product has been replaced or modified by anyone other than Owl Labs or an authorized service partner, or; the Product has been taken or used outside of the country it was purchased, or; the Product’s original serial number has been modified or removed. NO OTHER WARRANTY, EXPRESS OR IMPLIED, INCLUDING WARRANTIES OF MERCHANTABILITY OR FITNESS FOR ANY PARTICULAR USE, APPLIES TO THE PRODUCT. OUR MAXIMUM LIABILITY HEREUNDER, REGARDLESS OF THE BASIS OF THE CLAIM, SHALL BE THE AMOUNT PAID BY YOU FOR THE PRODUCT. YOUR SOLE REMEDY AND OUR SOLE OBLIGATION FOR A NON-CONFORMING OR DEFECTIVE PRODUCT SHALL BE THE WARRANTY REMEDIES SET FORTH IN THIS WARRANTY STATEMENT ABOVE. Owl Labs shall not be liable for punitive, consequential, special, indirect or incidental damages or expenses of any kind, or loss of revenue, business or property, inconvenience, or interruption in operation experienced by You for any reason, including without limitation due to a malfunction or defect in the purchased Product, regardless whether Owl Labs was aware of the possibility of such damages or issues or was negligent. No warranty service performed on any Product shall extend the applicable Warranty Period except as expressly set forth above. This warranty extends only to the original purchaser and is not assignable or transferable. This warranty and any dispute related thereto is governed by the laws of the Commonwealth of Massachusetts, excluding its conflicts of laws provisions, and is subject to the exclusive jurisdiction of the federal and state courts located in the Commonwealth of Massachusetts, and You hereby agree to submit to the jurisdiction of such courts.